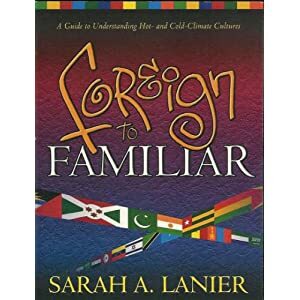 If you ever want to travel or just relate with people from different countries and cultures, I definitely recommend this book by Sarah A. Lanier. Miscommunication is a huge problem cross-culturally and Lanier delivers a simple, practical, clear guide to avoiding the common mistakes that foreigners make. Hot and cold climate cultures are somewhat generalized but the basic principles that guide her advice are logical and will save foreigners from a lot of miscommunication, misunderstanding, and loss of friendship. Some of the title chapters include: Hot- Versus Cold-Climate Cultures, Relationship Versus Task Orientation, Direct Versus Indirect Communication, Individualism Versus Group Identity, Inclusion Versus Privacy, Different Concepts of Hospitality, High-Context Versus Low-Context Cultures, Different Concepts of Time and Planning, and Practical Next Steps. If you ever plan on visiting another country or making friends with someone from another country, I highly recommend reading this easy-to-read book that is jam-packed full of essential information for reaching out to people cross-culturally. Be wise and read this book. You won’t regret it. You will gain understanding about how to approach your travel and develop friendship-making skills. Thank God someone wrote this book.